While your baby can sleep in a crib or crib bed from birth they need somewhere to sleep during the day that’s comfortable and easy to move around the house. A moses basket allows just that! But finding the best moses basket can be hard, there are so many brands and so much choice it can get a bit confusing. So I’ve done the research and written this guide to help you out with everything you might need to know about buying yours. Then I’ve found and reviewed my favourites at Amazon and John Lewis so you can click through and order yours today! The most important thing to know about moses baskets is that you shouldn’t really carry your baby in them. Not what you expected I’m sure but ideally, if you have to pick it up and move room you want to take your baby out move the basket then put them back in. But sometimes they’re sound asleep and you don’t want to wake them so just make sure you grab both handles with one hand and put the other hand underneath to support the bottom and you’ll be fine. But don’t carry it downstairs like that, for stairs always take her out and carry her separate to the basket. I won’t go into too much detail here because the Lullaby Trust have so much great information on keeping your baby safe while they sleep so it’s well worth checking them out. The most important one is too make sure your baby sleeps on their back. Apart from that you only want to keep them in the Moses Basket while they’re small enough to fit and before they start grabbing and pulling themselves up. That’s when it get’s dangerous because there’s always a chance they pull themselves out. And if your baskets on a stand that won’t end well. Then it’s just common sense. Make sure the baskets in a safe place, don’t have them near anything that can fall over, don’t put them in the direct sunlight from the window. 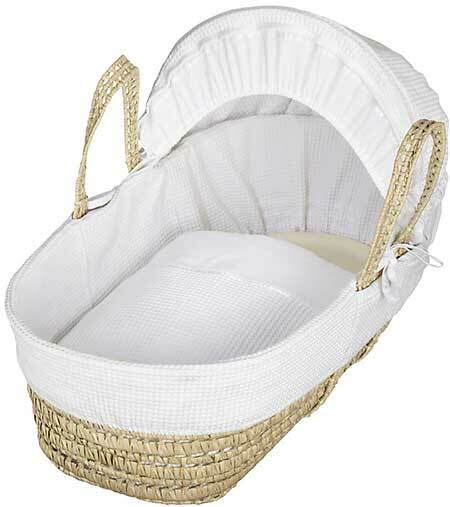 It depends on how big your child is but in general, you can use the moses basket from birth until about 4 months. Of course, you know best so if your little one is smaller you’ll be able to use it for longer but then if they don’t fit it’s time to move on. Moses baskets make a really great gift. You get some that just look amazing but are maybe a bit costly for your average parent so if you’re looking for a good practical baby gift look no further. And it’s time for the main event! I’ve gathered together the best moses baskets and given a short review of each. They’re all linked through to where you can buy them so you can click through and order yours today. 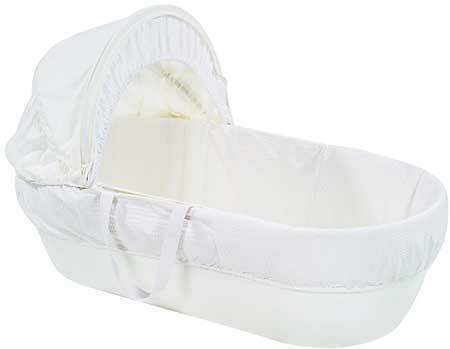 The Shnuggle moses basket is sturdy and reliable with a locking system to stop the hood falling down. It mainly feels good because it’s not wicker, the wicker baskets are totally safe and very strong but for the safety-minded parent this’ll be a great choice. The handles are made with fabric so you definitely want to hold it by the handles and the bottom if you’re moving your baby. This is the most expensive basket on the list but it’s also the most beautiful. An embroidered rabbit design on the main cover and a polka dot hood just make this the nicest moses basket on the list. 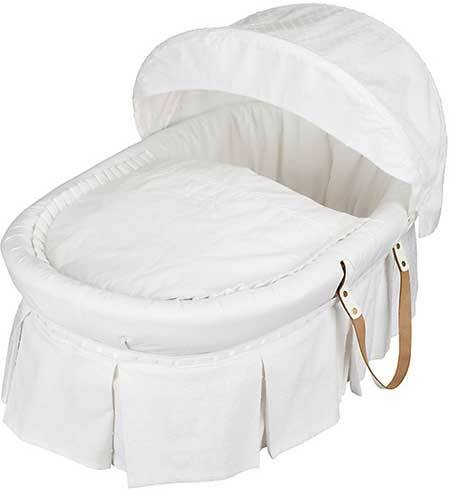 Again cotton covers make it lovely and soft and the ideal little sleep station for your baby. You do have to assemble the stand but it’s fairly straight forward. The stand itself is nice, fits nicely with the basket and rocks gently back and forth if pushed lulling your baby off to sleep. The mattress is easy to clean and the wicker basket has leather handles which are nice and sturdy. A great price since the rockers included. 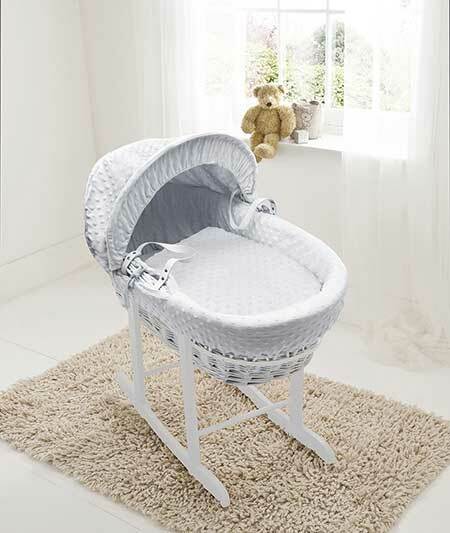 Cheap and simple the John Lewis Moses Basket is a great budget choice. Not the prettiest and maybe just a little flimsy but it’s still strong enough for your baby to lie in comfortably. A good choice if you don’t have the money for the others. Can the baby sleep at night in a moses basket? Yes, it’s not just for daytime use your baby can sleep at any time day or night in the moses basket. Do I need a basket stand? Entirely up to you. Some people like them because it makes it nice and convenient to check on them instead of on the floor but others don’t because they’re worried the basket might fall off the stand. Can I buy one second hand? You can indeed! As long as it’s still in near new condition and the handles aren’t fraying or near breaking at all. If you do buy a second-hand basket make sure you get a new mattress for it. You never know how clean the old mattress really is.